Today is a milestone for Auto-Safe. We started a new business called Auto-Safe Properties LLC and acquired the property where we have been leasing from Chaplain Ministries. We are so thankful for the opportunity to lease from the chaplains and the relationship we have developed with them. Acquiring the property was not in our plans, but we are thankful for the opportunity and how will open up more opportunities for Auto-Safe in the future. Our owner Jim Collins won the award at the November conference of the South Carolina Driver and Traffic Safety Education Association. This is a great honor and one well deserved! Below is a picture of the only other two that have received this award in association history. 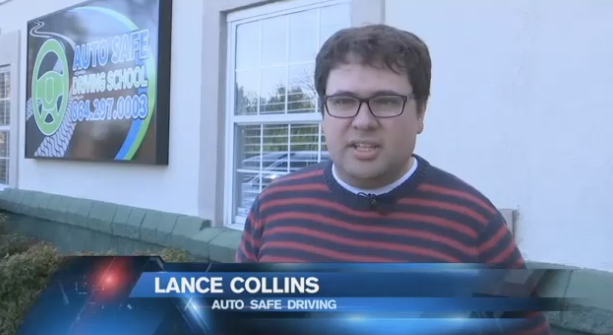 Tonight on Fox Carolina Auto-Safe will be featured in a story on surviving blow outs. This story will be featured at 4 PM and 10 PM.